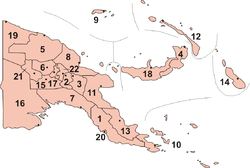 For administrative purposes, Papua New Guinea is divided into administrative divisions called provinces. Provincial governments are branches of the national government – Papua New Guinea is not a federation of provinces. There are 22 provinces, that includes the autonomous region (Bougainville) and the National Capital District. In 2009, the PNG parliament created two additional provinces, that officially came into being on 17 May 2012. They were Hela Province, which was split from Southern Highlands Province, and Jiwaka Province, which was split from Western Highlands Province. Each province forms a provincial electorate, called a constituency, for the PNG national parliament. The 22 provincial members are chosen from single-member electorates. Each provincial member becomes governor of their province unless they take a ministerial position, in which case the governorship passes to an open member of the province. Immediately before independence on 16 September 1975, Papua New Guinea was divided into nineteen provinces and the National Capital District. These provinces corresponded to the "Districts" of the pre-Independence administration of the Territory of Papua and New Guinea. It had been considered that an independent state with limited resources could ill afford the infrastructure of a two-level quasi-federal governmental structure. However, a secessionist movement in Bougainville, whose copper mine provided the largest single source of foreign exchange and whose contribution to the general revenue was crucial to the independent state's economic viability, forced the issue. The Bougainville secession movement declared the Republic of the North Solomons on 1 September 1975 and the central government very quickly responded by offering provincial status to Bougainville. For the sake of consistency, as there were or had been regional separatist movements in Papua and East New Britain, provincial status was offered to the other 18 Districts as well. Bougainville continues to be a special case. A renewed secession movement emerged in 1988 and resulted in a violent military campaign on the island, the closing of the Bougainville Copper Mine with serious financial consequences for the central government, the destruction or running-down of most infrastructure on the island and, ultimately, the total quarantining of the province for a decade. The Sandline affair of 1997 was a political scandal that became one of the defining moments in the history of Papua New Guinea, and particularly that of the conflict in Bougainville. The Bougainville secessionists came to terms with the central government in 1997. A constitution was drafted for a more autonomous regional polity within Papua New Guinea with its own president and provisions for a referendum on total autonomy in due course. Until 1995, the provinces had elected provincial assemblies and cabinets led by premiers; however, the country remained unitary, not federal. Unlike Canada, Australia and the United States, whose federal governments are creatures of the provinces or states, but as with the provinces and states of Pakistan and India, the provinces are creatures of the central government and can be suspended by it or have their boundaries changed. Indeed, there have been suspensions of several provincial governments to address corruption or incompetence by elected provincial governments. Changes in the boundaries of those provinces which are adjacent to the former boundary between the Territories of Papua and New Guinea can cause special complications in the administration of statutes which apply in Papua or New Guinea but not both. Ultimately in June 1995 in an effort to re-assert a measure of control by the central government over the often wayward provinces in an environment of limited numbers of personnel qualified for public office in many of the provinces, the office of provincial premier was abolished and the regional (at-large) members of Parliament became provincial governors, while also retaining their seats in Parliament. Several provincial governments have adopted a local name for their province. For example, Bougainville became North Solomons, Western became Fly River, Chimbu became Simbu, Northern became Oro and West Sepik became Sandaun. Though these names are accorded popular acceptance, they remain unofficial, as formal changes in province names requires amendments to the Constitution, using the prescribed amending formula. In May 2012, two new provinces were established: Hela Province was split from Southern Highlands Province and Jiwaka Province from Western Highlands Province. On a broader scale, PNG is divided into four regions. The regions are quite significant in daily life, and are often the basis for organisation of government services, corporate operations, sporting competitions and even the machinations of politics. For instance, there has been much discussion over the years of how many Prime Ministers have come from each region, and whether a particular region is due to provide the next one. Ministers and departmental heads are often appointed with an eye to maintaining an overall balance between regions. Highlands Region: Simbu, Eastern Highlands, Enga, Hela, Jiwaka, Southern Highlands, and Western Highlands. Islands Region: East New Britain, Manus, New Ireland, Bougainville (North Solomons), and West New Britain. Momase Region: East Sepik, Madang, Morobe, and West Sepik (Sandaun). Papua Region: Central, Gulf, Milne Bay, Northern Province (Oro), Western (Fly), and the National Capital District. Momase is a recently devised portmanteau word which combines the first two letters of Morobe, Madang and Sepik. ^ "About Our Parliament". National Parliament of Papua New Guinea. ^ "PNG creates two new provinces in the Highlands". Radio New Zealand International. 15 July 2009. Retrieved 4 November 2011. This page was last edited on 31 August 2018, at 18:58 (UTC).